Many parents find it challenging to get their kids to happily buckle their seat belt, use a booster seat, or allow their parent to buckle them into a car seat without a battle. However, new research reveals how critical it is for children to be properly restrained while they’re traveling by car. If you or your child has been seriously injured in a California accident when improperly restrained, contact an attorney to find out if you may still be entitled to money damages for those injuries. The Journal of Pediatrics recently published a study looking at the factors that most often play a role in fatal accidents involving children. The researchers from Brigham & Women’s Hospital in Boston used data gathered by the Fatality Analysis Reporting System between the years of 2010 and 2014. The researchers analyzed over 18,000 fatal accidents which involved a child under 15. In nearly 16% of these accidents, a child was one of those fatally injured. The study looked at a number of variables such as the type of vehicle in which the child was traveling, whether the accident occurred on rural roads or highways, and the laws on restraints in place where the accident occurred, to determine which factors increased the chances of fatal injury to a child. The researchers concluded that, in 43% of all accidents studied where a child was killed, the child was either improperly restrained or not restrained at all at the time of the accident. 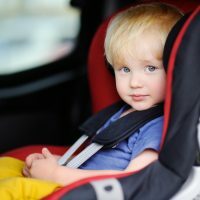 In an additional 13% of accidents that resulted in fatal injuries to a child, that child was seated in the front seat when they should not have been. California drivers are required by law to ensure not only that they are using a seat belt, but that their passengers are, as well. If a driver or their passenger is injured in an accident while not wearing a seatbelt, then the at-fault driver may try to claim that they should not be compelled to pay the full amount of the victim’s damages, since the victim made their own injuries worse by not using a restraint. However, this does not mean that victims who weren’t properly restrained have no right to compensation for their injuries. A skilled accident defense lawyer can use testimony from experts in biomechanics and medicine to help you prove to what extent injuries would not have been prevented even with the use of a seatbelt. If you or someone you love has been injured in a traffic accident, find out whether you should file a lawsuit for money damages by contacting the knowledgeable, seasoned, and effective Palmdale car accident lawyer Paul Kistler for a no-cost consultation, at 661-206-6990.